This week the WordPress.com photo challenge is brought to us by Michael Pick. He asked us to take a picture of ourselves or of someone else as a shadow, a reflection, or a lesser part of a scene, making the background, or the foreground, the center of attention. 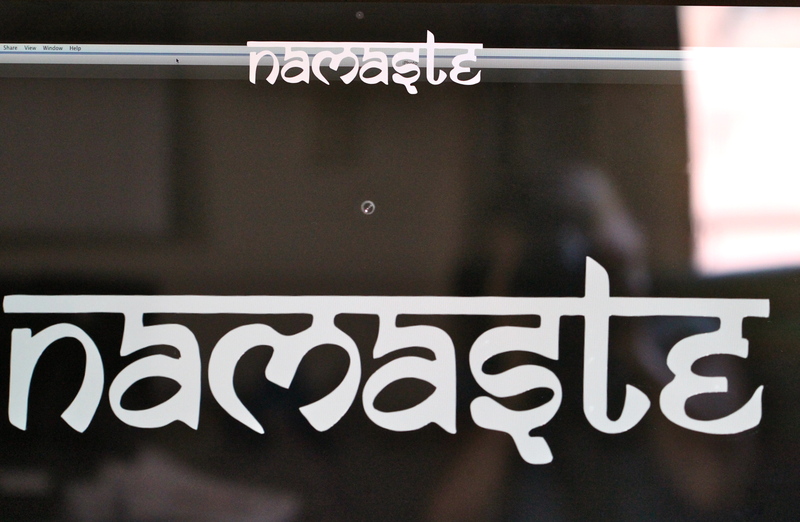 The Hindu word, namasté (pronounced nah-mah-STAY). This one was not as easy for me to capture as I anticipated. Remember I am a total amateur photographer. I never even tried to take creative shots until this past year and I still use the auto settings on most shots. I decided to take a photo of a recent addition to my computer screen with me in the background creating a shot similar to Michael’s. My first attempts did not show me at all because I was using the blank screen which was black. The flash came on in most of the auto settings too and this resulted in a rainbow bunny ear type of image from a light I turned on to try to prevent this. Then, I resorted to using the flash disabled setting normally used for dark scenes, but even then I found I needed some light to reflect my image onto the screen. Finally, I opened a curtain and centered the image from one of my first attempts onto the screen, so there was more light to reflect my image allowing me to capture this image.